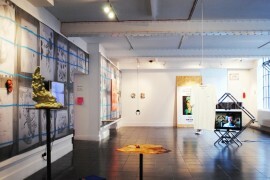 MODEL is a new artist-run gallery in Liverpool that aims to provide a flexible and experimental platform for artist-led activity in the city. 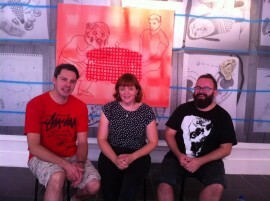 Laura Robertson pays a visit and speaks to its three founders. Being surrounded by the work of artists all called Tom is a strangely unnerving experience. I’m in MODEL, a new art space in Liverpool city centre, billed as a ‘flexible, experimental and research-based platform for artist-led activity’. Launched in July in the former Open Eye Gallery on Wood Street, it is the idea of three artist-curators: Dave Evans, Fran Disley and Kevin Hunt. The show is a playful display of contemporary art informed by Hunt’s love of sculpture. Tom Whittle’s sketchbook drawings are photocopied, enlarged and mischievously used as a background discussion for Tom Worsfold’s odd screen-printed paintings and Tom Gidley’s lumpy, speckled clay sculptures (at one point hung over the face of one of Whittle’s portraits); Tom Ireland’s Untitled Nike Trainers stand before it all, grandly; witness to – according to its extended title – a meteorite from the 16th century. It’s all rather exciting. 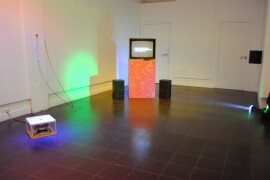 MODEL has a very short, intense lifespan; this iteration of the project runs until early November, and includes three main shows, running roughly for one month each, with six parallel ‘COMBINES’ – or project space exhibitions – that last for just one week. Evans, Disley and Hunt’s curatorial interventions are all related to their own practice, allowing them to work with other artists from around the UK who share similar research interests. The beginnings of this space can be traced back to a set of lively conversations earlier in the year amongst Liverpool’s artistic community, that discussed the lack of new, fiery, energetic spaces in the city. 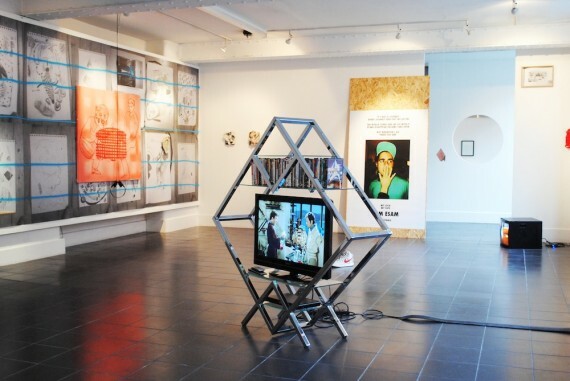 Wanting to exhibit during the 2014 Liverpool Biennial, the three started looking at different venues and became conscious that something more ambitious was possible. As a result, four assistants – Hope University graduates Becky Peach and Greg Herbert, and Liverpool John Moores University’s James Worley and Theo Vass – are working at MODEL as administrators, curatorial assistants and invigilators. They will also receive part-funding to initiate activity of their own under the mentorship of MODEL. When I speak to the assistants, it is clear that this opportunity is a vital step on the arts career ladder. They enthuse about the real skills it provides, with the room to develop their own ideas. For the three founders, it’s essential that young artists use the example of MODEL as a catalyst. “We couldn’t say this is easy,” says Hunt, “but at the same time it’s not that difficult, it’s not impossible. As Evans sees it, MODEL wouldn’t have happened without the support of others: finding a combination of a flexible landlord in Urban Splash (who provided the building rent-free); advice and encouragement from Open Eye’s artistic director Lorenzo Fusi and new head of art at Liverpool John Moores University Rory Macbeth; and practical help from The Royal Standard gallery and studios (TRS) , who used its charitable status to take on MODEL’s lease, slashing business rates and making the overall running costs affordable (Evans, Disley and Hunt are all former Royal Standard directors). “We can’t underestimate places like The Royal Standard,” says Evans. “Maybe that’s its natural evolution, that it supports artists to break out of an isolated community. While MODEL’s founders are keen to emphasise how grateful they are, they also see wider institutional support as a potential double-edged sword. Discussing the different ways that Liverpool’s arts organisations have helped the group – loaning equipment, sharing international visitors – leads us to discuss the role of the publicly-funded institution. What are their perceived responsibilities to artists and what does the natural evolution of spaces such as TRS look like – starting off very small, gradually growing into an arts charity with more studios, more funding and therefore more programming and structural remits. “We have an institutional culture in this city,” Evans says. “There’s no counterculture or avant-garde in the visual arts anymore; because the institutions are so dominant in the city, the smaller organisations begin to morph into the larger institutions. Hence the emergence of MODEL, which feels anarchic and irreverent while managing to be genuinely ambitious. COMBINES #3 is a great example; Evans’ wild kinetic sculptures dance along to Mike Carney’s rave mixtape with carefree abandon, with each sculpture made in response to artist Erica Ayres’ silent film. For COMBINES #4 (23-28 September), Jason Thompson and Arthur Roberts will display and respond to works by William Blake. “The first two shows were quite sculptural,” says Hunt, “but on a conceptual level and a visual level, MODEL will change quite significantly. We’re trying to get people to get used to constant change. We’re still learning! It’s really clichéd, but true.